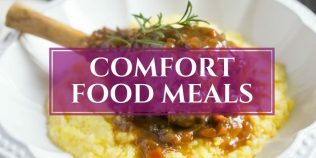 A food blog with hundreds of tried and true recipes from comfort food main meals to tasty desserts. 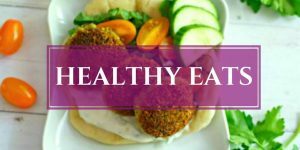 Inspiring you to cook with whole foods and minimally processed ingredients. Braised Beef Short Ribs are slow cooked for hours in a red wine, beef stock, and rich tomato sauce. Perfect served over mashed potatoes, risotto, rice, or noodles. Full of tender, fall off the bone, meaty goodness! 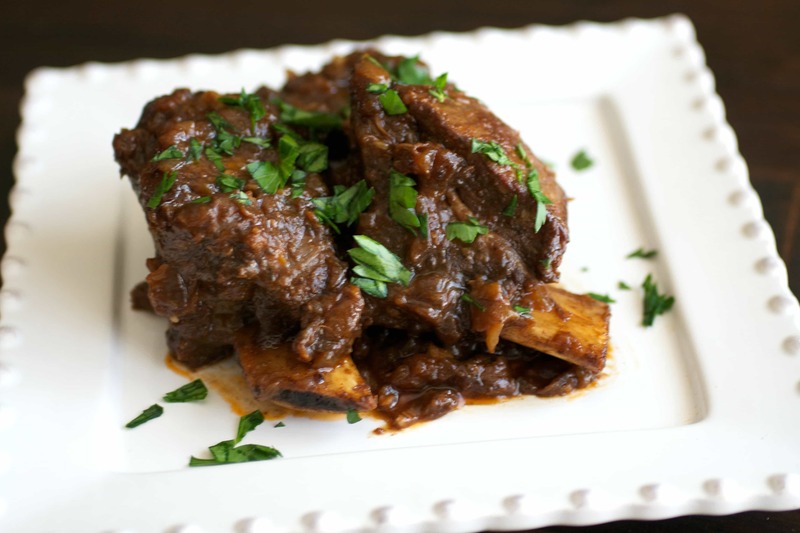 This braised beef short rib recipe is one of my all-time favorite comfort food dishes. There is nothing more comforting to me than a meal of red wine braised short ribs served over mashed potatoes. So rich and flavorful! Slow cooked beef short ribs are super easy to make, yet exceptionally impressive. 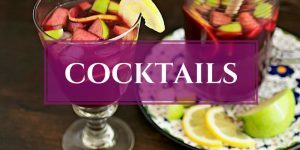 It’s a fantastic family dinner or a great romantic date night at home kind of meal. It can also be made the day before and heated right before serving for added convenience. Flanken style is a thin cut (1/2 inch thick) of short rib that is cut across the bone, so each piece is mixture of bone and meat. This type of short ribs is most often found in a Korean BBQ recipe called galbi. These ribs are typically cooked quickly over high heat. English style is cut between the rib bones, so each bone has a thick meat on top. 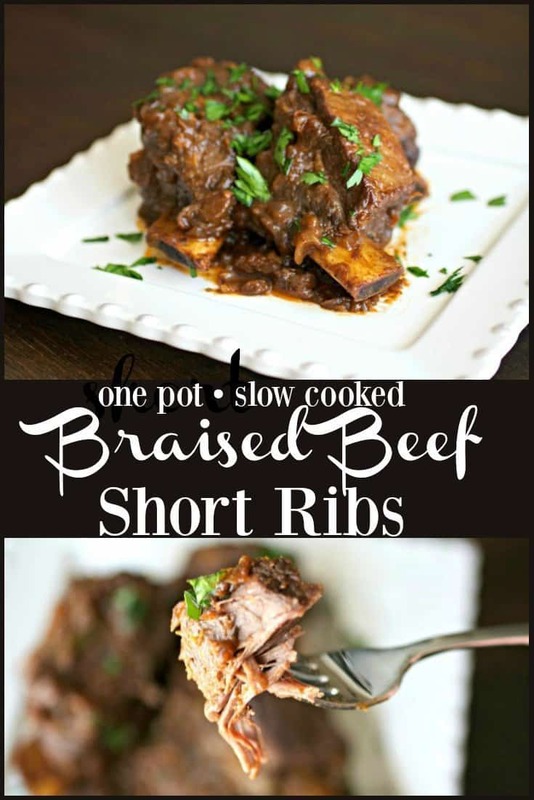 This recipe uses the English style and it’s also the cut that’s used for boneless short ribs. Due to the thickness of these ribs, they are typically cooked by a slow and low method. Just take a look at those grass fed short rib beauties in the picture above that I bought at a local holistic organic farm. Cooking with farm-to-table ingredients and buying from farms who honesty care about their animals, the land, and providing healthy food for the community is so rewarding. If you want to start buying from your local farms, look them up on Eat Wild and get some good grass fed beef ribs for this recipe. Beef ribs are seared and browned over high heat in a big pot, then add fresh garlic and onion, red wine, beef stock, and a little tomato paste. Cover and bake for up to 3 hours (for bone-in). SO EASY!!! 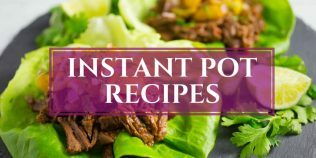 It’s all transformed into a glorious sauce that is perfection poured over mashed potatoes, polenta, noodles, or even cauliflower mash, sweet potato mash, or roasted winter squash. The sauce will thicken on it’s own, so there’s really no need to use flour to thicken, just uncover the pot and serve. Did you enjoy these Braised Beef Short Ribs? 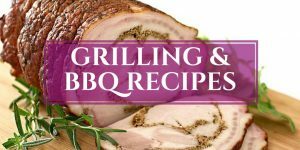 Let me know by leaving a comment below and please don’t forget to share the recipe with your family and friends. Beef short ribs are slow cooked in red wine, hearty beef broth and a rich tomato paste that's perfect over mashed potatoes, risotto, rice, or noodles! Full of tender, fall off the bone, beefy goodness. 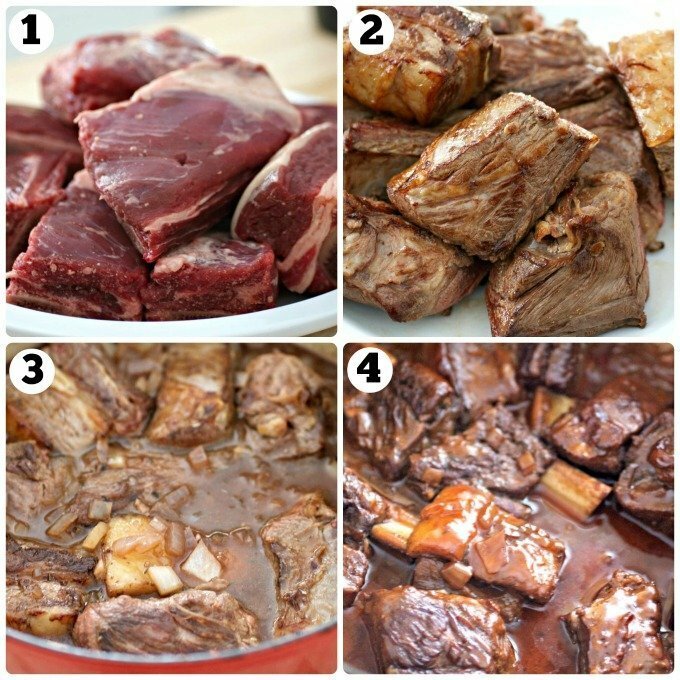 Take the beef short ribs out of refrigerator and let come to room temperature before cooking (about 1/2-1 hour). Preheat oven to 325F/162C degrees. Heat a large dutch oven over high heat. Add tablespoon of olive oil and sear short ribs on all sides until brown, adding additional olive oil as needed. Remove from pan and set aside. Add onion and garlic to the pan and sauté until lightly browned, about 3 minutes. Add wine and cook until reduced by half. Add beef stock, tomato paste, and thyme. Stir well and bring to a boil. Return short ribs to pan, cover, and place in the preheated oven. Braise for 2 1/2-3 hours, or until beef is fork tender. If using mushrooms, add them to the pot with the short ribs the last 30-45 minutes of cooking time. Place cooked ribs on serving dish. Skim excess fat off top of the cooking liquid and reduce over high heat to thicken into a sauce, if necessary. Spoon sauce over short ribs and sprinkle with chopped parsley. Can make the day before and reheat the next day. Leftovers are even better the next day so make a double batch! Going to the butcher right.meow. short rib omelette yes please! Love me some short ribs! It was our Christmas lunch, everybody enjoyed. I doubled the sauce, otherwise, I followed all instructions and it was really perfect. So glad everyone enjoyed it Lucie and thank you so much for the feedback! Happy new year to you all. Ok, this looks like the best thing ever. How did I miss this on your blog? When I come to visit, you have to make this for me!! YUMMMMMMM! Super Easy and super delicious. Very decadent meal. My family continually asks for this. It was very good on mashed cauliflower as well. Thanks so much for the review Jason and so happy your family likes the recipe! 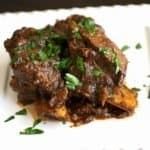 It’s one of my family’s favorite too and I’ve substituted beef shanks when I can’t find short ribs to fantastic results. A side of mashed cauliflower sounds so delish! First time making Short Ribs. DELICIOUS RECIPE, will definitely make this again. Followed directions exactly, sauce dried up a bit while cooking in oven, will double sauce next time. But this recipe is a Winner. Thank you. Thank you Camille and so happy you liked it! When I have cooked short ribs in the past, there is a lot of fat released in the cooking. Do you skim the cooking sauce before serving? Hello Bev, yes to skimming any excess fat off the top before serving. Hi Karrie! First off, let me say the pics on this post are great and the recipe sounded amazing so I’m going to try it. I cook quite a bit, but it will be my first time trying a “braised” method of cooking. But there is one thing I saw that may confuse your readers. When describing the meal at the beginning, it say “beef broth”…….but the recipe calls for @beef stock” . And this is why I’m mentioning it. Up till today, I had never used either. At the grocery store, they’re stocked together, so I had to do some research to see if they were the same thing, which I found that they are not. End of story, I went with the beef stock, since it was on the recipe list. Now I gotta see if I can get mine to look and taste as good as yours. Thanks for sharing the recipe. Thanks for your kind words Myron! Thank you too for the catch and I changed the script in the text, so it’s less confusing. Braising is one of my favorite ways of cooking because it’s so easy and provides maximum flavor/results. Hope you like it too and hope you enjoyed the short ribs! This was excellent. I did season the ribs with a little salt and pepper before browning. I would definitely make it again! This was beyond delicious! 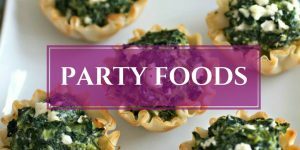 I made it last night and have already shared your recipe with friends … it’s THAT GOOD!!! Thank you so much for your comment and for sharing the recipe Lisa! Gotta love beef short ribs and it’s such a great comfort food meal too, especially in the winter. These look absolutely divine. I can’t wait to try the recipe!! The great thing about short ribs is that you can put out a meal that looks like it’s out of a 5 star restaurant! They’re so luscious. Great recipe. So true Mimi and thank you! These ribs look fabulous! Love how elegant and easy they are! So easy and great for date night at home. What delicious-sounding ribs! I love serving things like this with pasta, believe it or not. Sometimes, I’ll get a little extra liquid in the pot and toss the pasta in at the last minute, so it cooks as the ribs finish. That sounds delicious Jeff and trying these over pasta next time! Making these with kids in mind, substitute for wine? Hi Linda! The alcohol will evaporate out of the wine while reducing (it burns off at 172°F), so shouldn’t be an issue. If you’d like to leave the wine out entirely, just substitute a little more of the beef broth (1/4 cup should be fine). Hope you enjoy the recipe! It seems like we have been eating a lot of the same dishes lately. Your short ribs look so very tender. I missed the beef stock in the recipe but I have chicken broth . Can I use that? Yes you can substitute chicken broth for the beef broth, Patrice! Mine have another hour to braise.. Followed your directions to the letter.. I know they will be perfect it’s literally my Dads favorite dish and at 83, he gets what he wants for Sunday dinner. Garlic Mash potatoes are going to be the perfect match! Good eats for Sunday dinner tonight Karen! Wish I was your neighbor because I’d invite myself over (I’d bring rolls and dessert) LOL! Please let me know how you all like it and especially what your Dad thinks of the recipe! Really hoping he loves it and good choice on garlic mashed potatoes…those are the PERFECT side. I went to a little effort with the ribs and removed the ‘silver’ skin off the bones. I think that also helped to make this the best beef ribs ever. Partner and I consider this the best beef rib experience ever. Thank you so much Roman and I’m so happy you both enjoyed the recipe!!!! Oooooooooo POPOVERS!!!! I’m making popovers next time I make the short ribs! Very happy you liked the recipe Lindsay and thank you for taking the time to leave a comment. Haven’t tried cooking potatoes with the ribs, so please let me know how it turns out if you try it. Can I use a large cast iron pan ? Hi Deb, a large cast iron pan should work, as long as you have a tight fitting lid for it. Please let me know how it turns out for you! 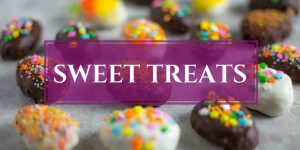 Tasty Ever After is a participant in the Amazon Services LLC Associates Program, an affiliate advertising program designed to provide a means for sites to earn fees by advertising and linking from tastyeverafter.com to Amazon.com.